Is Gil Student מזרע ישראל? After writing such an article? The point is that you can think what you want about them, you can discuss it in shul between mincha-maariv, and even tell your wife what you think, but don't show the whole world how heartless you are, no matter how much you dislike the Mishpacha, or Bleich, or anybody involved here. Oh! and that whole "law and order" charade is a bit tired too. Right now the Tzig is at a stage as far as the blog is concerned where nothing is good enough for the blog. Nothing passes muster. Everything is silly, passe' or both. Even a wonderful, glorious, derhoybene Shabbos next to the Kodesh hakodoshim biZman HaZeh is not enough to get me to write, despite the uplifting time had there by all. Do I write about Lubavitch? Satmar? Telshe? Ponovezh? Vizhnitz? Kretshnef? 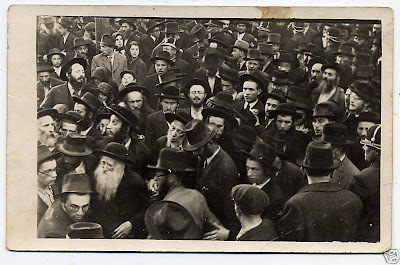 How about I go back to writing about my childhood in various Boro Park Yeshivos? You guys seemed to like that. Yes, I too loved that voice. The 'Het. 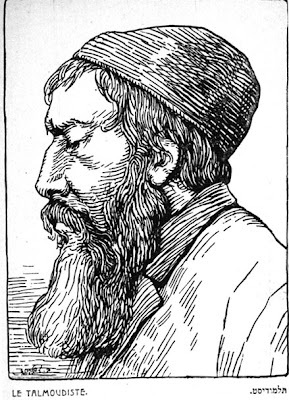 The heavy Ayin. The Silsulim. It was a pleasure to listen to. He had a massive stroke a while ago and suffered from Parkinson's disease. That powerful voice could hardly make a sound for the final years of his life. A newspaper in Eretz Yisroel printed the bottom picture this week. Nothing strange about that. 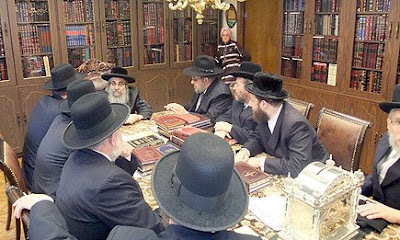 It's a delegation headed by the Mayor of Bnei Beraq, Yaakov Asher, that visted R Aron Teitelbaum of Satmar. We see some of Boro Park's finest "askonim" joined him on the mission.... Then somebody went and posted the uncensored version. That's the one on top. And there was lots of hooting and hollering about censorship, and how silly it is to black out the Rebbetzin standing in the corner of the picture. 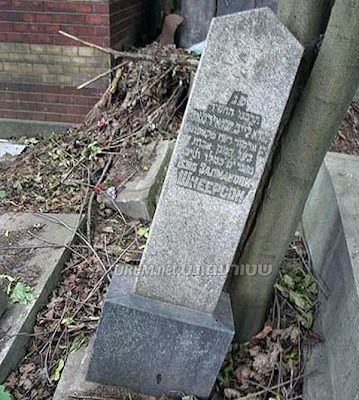 The Rebbetzin here is the daughter of the Vizhnitzer Rebbe of Bnei Beraq, may he live and be well. I have no problem with taking her out. Newspapers have rules so they stick to them. OK. But we fail to see the broader story here; how the Rebbetzin saw it her business to leave the kitchen and listen in, house dress and all. This doesn't seem like a one-time deal either, it seems perfectly normal, nobody deemed it out of the ordinary. I wonder if she added her two cents to the discussion, her being from BB and all. I dare say this scene seems refreshing to me; no gabboyim hanging over the chair smiling like fools. No mounds of fruit and silver dishes either. It's just a group of people having a business-like meeting. A heavy tablecloth, lots of seforim on a conference table with a bunch of 500 dollar chairs. HebrewBooks has so many treasures it could make a grown man cry. The latest one comes to us from a very active and devoted reader. 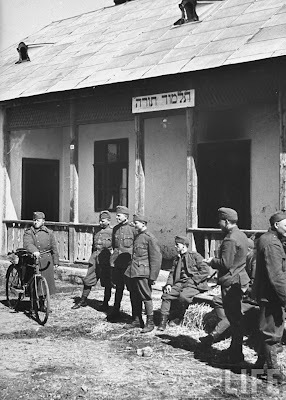 There's a book that speaks of the activities of the Agudath Israel in Romania after WWII, and there was much to write about. Communities were destroyed. Young adults came back to their towns only to find that there was nothing to come back to. Many - even if totally Chassidish before the war - were now drawn to the ideals of the idea, since it seemed like the only way out. I recall seeing a short video clip of an interview with an elderly Jew In Israel, where he speaks of his and his parents' deportation to Auschwitz in the summer of '44. This man is no longer religious, unfortunately, but his parents were Chassidishe Yidden, their pictures are flashed on the screen. He mentions that his father was so religious, that he was even worried that the transport from Romania to Auschwitz would arrive on Shabbos, which may lead to chilul shabbos..... The man then finishes off by saying זה שהוא נשרף בשבת זה כבר משהו אחר...... The irony is simply painful to watch. With someone like him it's easy to see how many said "G-d died in Auschwitz, c"v." This is what they tried to avoid when they organized after the war and tried to provide for the survivors. Which brings us to the letter here. We all know the Sighet-Satmar approach to the Agudah, Mizrachi and its satellites. This is not something that started only in post-war Palestine or in post-State Israel, it was the opinion of the Teitelbaums that they're both treif. Always were and Always will be. Not so much because of their approach to the Jewish question, (for lack of a better term) as much as not believing in what they were doing, mixing Rabbonim and Askonim and other such issues. They were not Reb Elchonon HYD, who had he survived would've most likely left the Agudah or Rav Dushinsky, who was a Agudist but anti-State, and passed away before the State came into being. You might say that in this in this sense the SR and probably his older brother the AC were like the Munkacser Rov, anti-Agudah in all aspects, and anti-anything the Agudah does, did, or will ever do. Daf Yomi is treif, Hachsharah for Kibbutzim are chazzer treyf, as is the word ALIYAH. You would think that since everything they did was treif that any cooperation would be as well. Surely a letter of admiration would be totally off limits too. Yeah, I know, Lubavitch was anti-Agudah too, but we're speaking about Sighet-Satmar now. 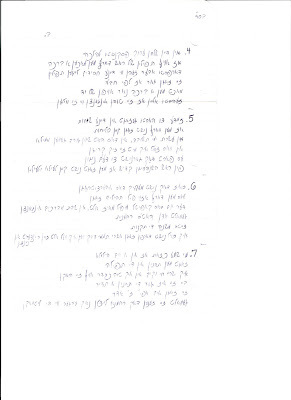 So the Agudah sends the Sigheter Rov a letter asking him to write a few words about the activities of the Agudah in Rumania, and he cannot stop praising them! He waxes poetic about how they saved lives. 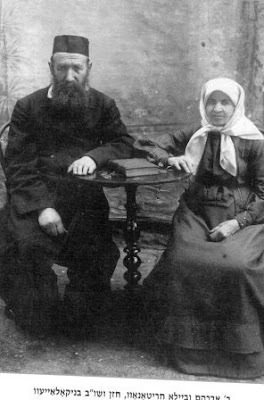 How these daughters of Israel had parents who were moser nefesh for yiddishkeit returned alone and broken in spirit and were saved only by the work of the "Kibutzim" that the Agudah in Transylvania operated. This is news! News that needs to trumpeted from the tops of tall buildings. You can appreciate what an organization does even if you disagree with what they're doing.... (huh?) I mean with OTHER things that they're doing, or with opinions they have about other activities. Yes, we can sit here and be amused at the fact that the man who would be Satmar Rebbe and Nosi of the Edah HaCharedis would be so open towards towards dialogue with the Agudah, but I see the good in it. I guess it's not for nothing that the more zealous ones didn't want to accept him when his uncle the DY passed away. They must've known about the letter. It wasn't the shidduch with the Vizhnitzer Agudist, it was the letter after WW2 that may have done him in as far they were concerned. ומסיימים בטוב. Why now, you ask? Why do I bring this up now? I don't know. I got them in an e-mail and liked them. 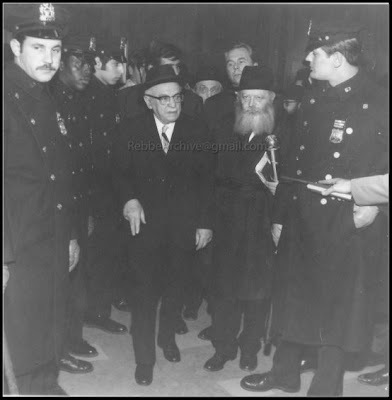 I also don't get what the big deal is/was that the Rebbe welcomed him with open arms. As a kid I heard that alot; that KivYochol, the Rebbe's big "aveiroh" was being too friendly with him and others of the Israeli Government. He was coming to the Rebbe altz chossid, plain and simple. He would sit by the farbrengens, listen to every word and do the best he could under the circumstances, especially since it had been a while since he was into learning, if you know what I mean.... Yes, issues of general concern in Israel were discussed in private, but so what? How did that differ from Yitzchok Shamir visiting the Vizhnitzer Rebbe ZGZ, or DBG visiting the Chazon Ish? Eh. why do I bother? 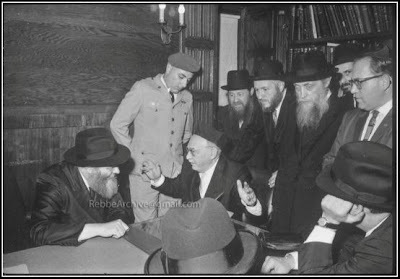 Mr. Abraham Herman, the Israel Council member in Washington D.C at the time, being introduced to the Rebbe. איך האב לעצטענס באקומען דעם ביכל "פון ווילנא געטטא" געשריבען געווארן דורך חייקל לונסקי ע"ה אין יאר תר"פ. דער ספר איז זייער אינטערעסאנט, כאטש גאנץ אומיטיג, און עס איז כדאי אים צו ליינען. איטליכע זאכן וואסן איך האב געטראפן צו זיין מערקווירטיג וויל איך פאר אייך מעתיק זיין. אויף עמ' 27 שרייבט ער "וואונדערבאר שיין איז געווען איז געווען אמאל דער ווילנער שמחת תורה אז ס'האט געהאט א שם. יונג און אלט, מיידלעך און ווייבלעך, אפילו זקנות פלעגן זיך צונויפזאמלען אין מאנסבילשער שול שמחת תורה, ס'איז געווען הפקר די וועלט..."
און בהמשך דארט עמ' 28 "עס פלעגט זיך ציען די הקפות, אפריער אלע ווילנער רבנים אין די שטריימעלעך מיט די געטליכער פנימער מיט די ווייסע בערד מיט די ספרי תורות אין די הענט ..."
און אויף עמ' 31 דערציילינדיק וואס דער גלות אפריכטער האט געזאגט פאר זיינע קינדער "אויך איך, מיינע ליבע קינדערלאך, זאג שוין צייט אייניגע חדשים דעם 70טען קאפיטל פון תהלים, ד"ה, אז איך בין שוין אלט 70 יאר און ס'איז שוין צייט מסתמא אהיים צו פארן"
די ביכל קען מען טרעפן ביי די אידיש בוך צענטער . לויט ווי איך פארשטיי איז חייקל לונסקי ע"ה געווען א פרומער איד און ספרן אין די גרויסע ווילנע אידישע (שטראשון) ביבליאטעק. We can sit here all day and agree that the authorities and the people of Monroe - the non-Jews - are anti-Semites who wish the Satmars never came in the first place. You won't get an argument from me on this one. We can also agree that there was no real reason to come and ruin the simcha (if that actually ruins it) by coming down there and removing the lights. But I'm sure by now the good people there have enough political clout that it would've taken would be a phone call or two to some local official and the lights would be back up, pronto. Why then the need to confront the police and make a colossal chillul hashem that may have very long repercussions? I'd go out on a limb and say that this is the only way they know. Like in Eretz Yisroel; they think that the only way to do things is to scream "Nazim" at the police and burn garbage. Abi they have taynes to the Tziyonim for provoking the Arabs. I b'etzem wouldn't bother with this as a post, since discussing politics is not my thing, but the likes of Burech, staunch defenders of the activity you see here, will you make you do that, especially when they ask for Sociology... I'm also shocked that the PR savvy knakkers in KJ didn't see this for what it was, a PR nightmare on all accounts, and stop this thing, if only for the consequences! I thank the blogger formerly known as Tzemach Atlas for translating and explaining the Russian words for me. Reader: Am I crazy on these? This paragraph reads like a cute joke. It first contrasts RAL to Chassidim to complement RAL, implicitly acknowledging that Chassidim/Rebbes are models of devotion to G-d.The writer/translator/editor/? uses the very same catalyst of Chassidim as a footstool to catapult and exalt RAL’s pious status far beyond that of a Chosid or Rebbe, effectively disparaging Chassidim as lesser models of Yiddishkeit than RAL. 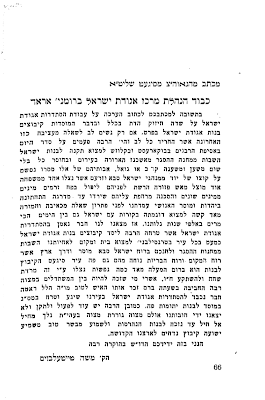 Halfway down the next page, where it starts "AT THAT MEETING," it attributes a life changing message coming from either the Frierdiker Rebbe or Rav Kook because they were the only ones in the room, and R. Aryeh didn’t say which one actually said it, but its logical that the Rebbe said it, yet the editor places Rav Kook’s name in parenthesis as the one who gave R. Aryeh a life changing message. I don’t get it; R. Aryeh, his long time friend Rav Kook who he visiting with, get together with the Lubavitcher Rebbe, the ICON of mesiras nefesh for a once in a life time meeting, and from this meeting R. Aryeh learns from his old time friend instead of the Rebbe? And the Rebbe taught him nothing? 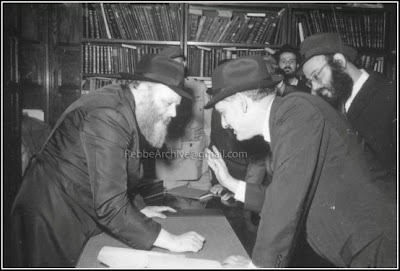 There is no doubt that R, Aryeh meant the Lubavitcher Rebbe. The best I could say is that this is an editor slip up. 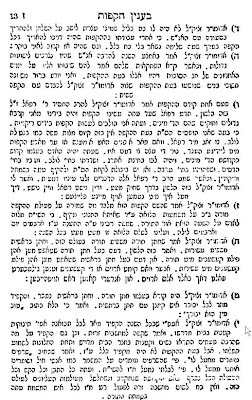 It seems that this story is likely a fabrication in an effort to prove and promulgate that the GRA is the progenitor of Ahavas Yisroel and the true Baal Shem Tov. The upshot is that if the GRA is the true BESHT, then the Lubavitcher Rebbe has no real tradition, and is cut down at his roots. Add to that the previous story on the page; the FR doesn’t even register as a somebody with a current message since RAL ‘learned’ from Rav Kook instead of the Lubavitcher Rebbe. Ad Kan the Reader. It seems like somewhat of a stretch, even to me. I recently came across these pictures in a closed forum. They were posted by a grandson of the Charitonows who graciously allowed me to post them here. Me being a big "fan" of their neginah I jumped at the opportunity. 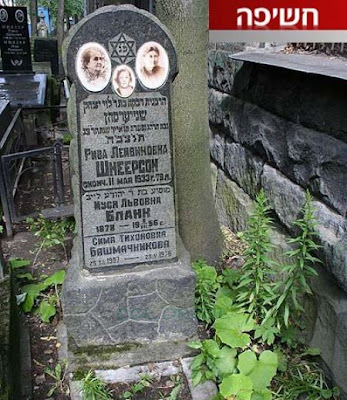 Reb Avrohom Charitonow - Chazzen & Shochet in Nikolayev - and wife Beila. Reb Sholom is my personal favorite. One of his nigunnim is in my blogger profile. To say that RSC had a tremendous Koach in Neginah is an understatement. He passed away in Moscow in 5694 at a young age. His son is Reb Shamshon Charitonow of Crown Heights, zg"z. 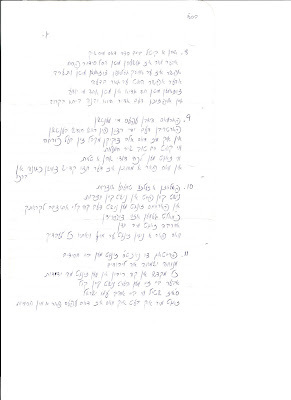 Here's the nigun, as sung by Reb Shamshon. Sorry about the quality... If this won't put a Hirhur Tshuvah in you no nigun ever will, IMHO. 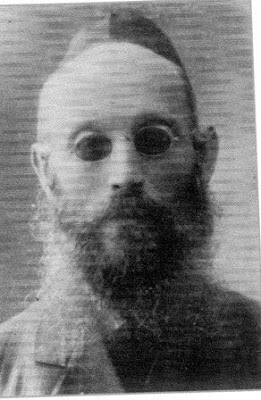 Reb Mordche Hersh Charitonow, HYD, son of Reb Aron. The following 2 pages plus the commentary underneath page 2 were received via e-mail. They're from "A Tzaddik In Our Time" by Simcha Raz. 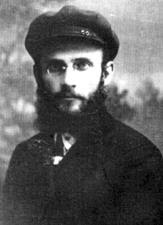 (The life and times of Reb Aryeh Levin.) The reader readily admits that maybe his thinking was skewed by reading too much Circus Tent, and that there's nothing inherently unflattering in this story. He asks for y'all's opinion. 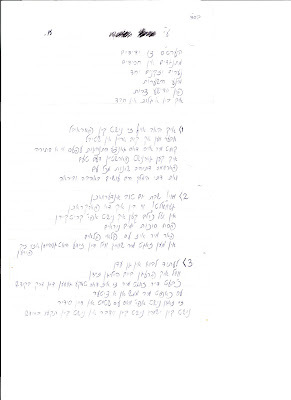 Reader continues: The Rov is distressed about a top bochur not getting his ‘deserved’ gashmius, when the top bochur was created for this; yet the regular bochur, who needs to have even more mesiras nefesh to be in yeshiva, getting far less material sustenance than a top bochur wouldn’t elicit the same tears. I would have omitted this story. It's not flattering at all to R. Isser Zalmen. 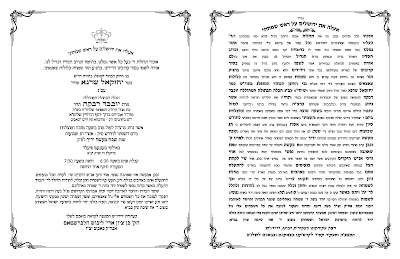 The following is the invitation to the Bobower Rebbe's son, married last week in Brooklyn. 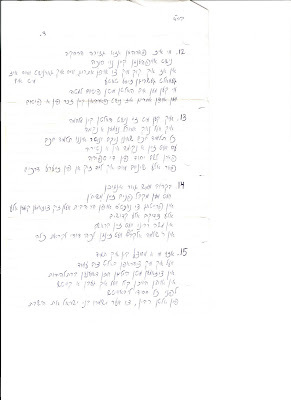 The nusach is somewhat of a piece of real poetry; notice the play on words on the cover, where the date of Ches Sivan is gracefully intertwined with the concept of basking in the glow of the Tzaddik, despite the Posuk not actually referring to the Tzaddik, but to the Holy One, blessed be he. It seems all the graphics and nusach people wanted in on the Brochos the Rebbe would surely bestow upon them on this, a very happy and momentous occasion, but they wouldn't have it. 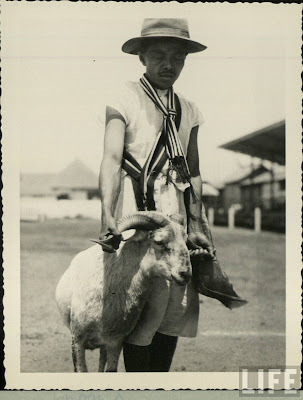 Baila Miriam - despite the work that she put in, was not allowed to have her name mentioned for all to see. At least not the Hamon Am; maybe the Rebbe did get to see that version and pray for them....Only Naftoli Zvi made the cut, and even his mother was left out...Thus is the fate of a Lubavitcher; he wants to look up the Yotzer and follow along with the invitation, but he hasn't one in his house! No Shavuos Machzor in the whole Tzig compound. I do have one in my childhood home, tucked away in my old room somewhere, but I never brought it with me, since I did not need it. I have my RH and YK Machzor haMeforash very prominently displayed with the other Machzorim, but no Sukkos, Pesach or Shavuos. A Lubavitcher goes from Yom Kippur to the seder Amiras Korban Pesach until he says something not in the regular davenen. Other than HaNeiros Halolu and Shoshanas Yaakov. Which is why I joined Lubavitch in the first place; the easy life, the getting drunk every day on Vodka, and the putting on teffilin with goyim and women too....Which means that next time I go home I need to find those machzorim and take them home with me. 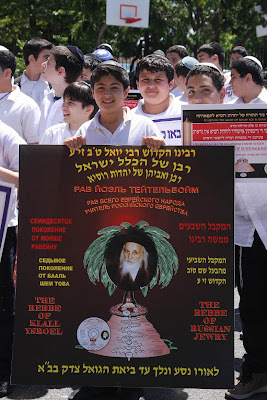 I guess we should be happy that it wasn't one of the present-day Rebbes that they proclaimed as RVSYR. That would be too much to bear. אויב שוין יא זאל זיין די סאטמאר רב, and not anyone else. However, I may still be surprised here after all. 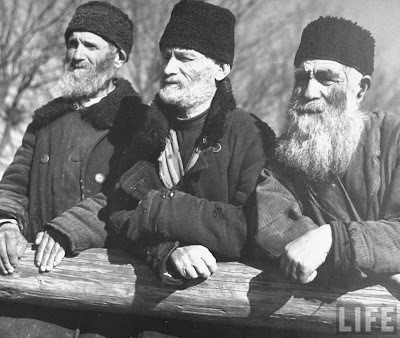 Some guy will come along here and tell me stories about how thousands of Russian Jews were helped with money from Satmarer Mosdos, and how the Satmar Bikur Cholim saved hundreds of Russian Jewish lives. 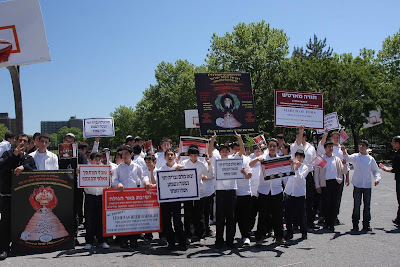 How, just like the Sefardishe Satmare Kehillah in Argentina, there are large Jewish Satmarer Kehillos of Russian Jews in Monsey, Monroe and even Williamsburg. How even Beer HaGolah was supported by the SR and his devoted Chassidim by raising millions of dollars clandestinely so that nobody should know that Satmar supports Kiruv. Maybe. OK, fine. That's not the point here. In the future I would tell the one thinking up these signs to stick to the more generic Rabbon Shel Kol Bnei HaGolah, a softer, more accepted title that also has recently lost its meaning and significance due to abuse by some groups. In the interest of full disclosure I would also deem it inappropriate if the Rebbe were dubbed "Raaban Shel Yahadut Sefarad." 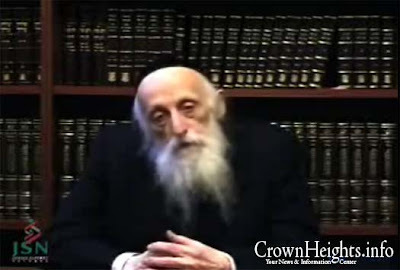 Despite the Rebbe's efforts and accomplishments, very often more than any other Sefardic Rav. RNZ and his father RYI at the levaya of his sometimes adversary, the Minchas Elozor of Munkacs, 2 Sivan, 5697. If I don't see nice, to-the-point comments here I promise I'll take it down. It took too much time for it to sit here and gather dust. A good start would be to comment on the inaccuracies in the rhymes. Warning! 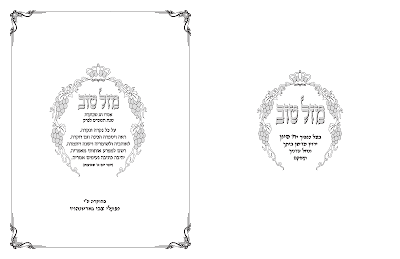 Knowledge of Lubavitcher minhogim, as well as the minhogim of the rest of Klal Yisroel is mandatory for you to understand the rhymes here. Not to mention advanced, spoken, Galicianer Yiddish. 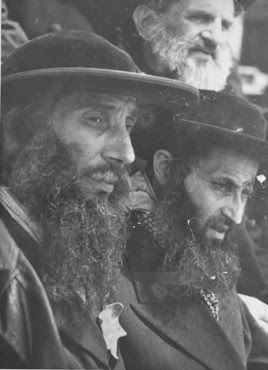 The grammen are the work of a scion of 2 Chabad Rabbeyim; the Alter Rebbe and his son the Mitteler Rebbe, who lived in a Mid-Atlantic U.S. Chabad community until very recently, and was subjected to their customs and Nusach Hatefilloh, despite not being raised amongst Lubavitcher Chassidim. He asks his zeide, the Alter Rebbe, why he did this to him, why is he making him omit all those wonderful Piyutim and Yotzros that he so loves to say? You might say hilarity ensues, it's just that those words are not very appropriate in this case. What you do get is a look into the mindset of some of the Yungeleit and Bachurim from other kreizen who join Lubavitch and later find out about all the differences in nusach and minhogim. Not me, of course, other people.